This is the second post in a series that traces the history of the popular neighborhoods of casas baratas (cheap houses) in Barcelona, a reservoir of immigrant factory workers in the middle of nowhere, historically anarchists and strongly involved in the Civil War against Francisco Franco. We will describe how this history led to the struggle of a group of residents against the urban renewal plan that is taking all of these neighborhoods to demolition. The urban renewal projects, executed by a leftist city administration, are presented as progressive and people-oriented, while inhabitants understand that it is economical benefit that prevails in the decision-making of the City Council. 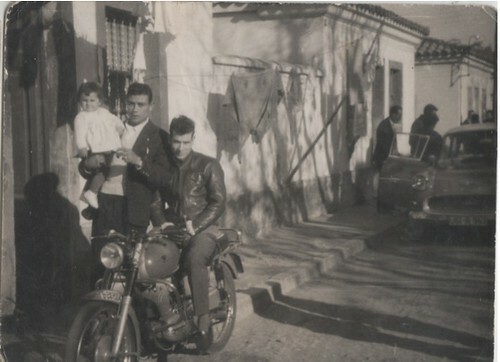 The neighborhood of Bon Pastor in 1956. The original photo is black and white. The dictatorship of Francisco Franco was not just forty years of autarchy and frugality, as is usually thought of it. People remember extreme hunger, tuberculosis and the continuous murders and violence of the grises (the ‘grey ones’, the Guàrdia Civil military police). Franco’s propaganda deliberately mixed political resistance and small criminality, so the casas baratas became associated with robbery and smuggling, as well as rojos (the “red ones”, i.e. the antifascists). In the biggest of the four neighborhoods, a priest decided to save the reputation of his parishioners by changing the name of the Casas Baratas Milans del Bosch to the name of its church: Bon Pastor. 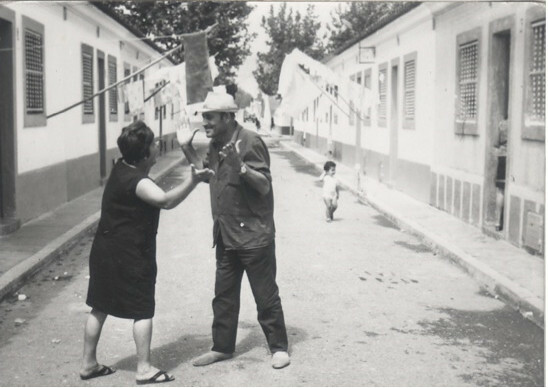 Life on the streets of the Casas Baratas of Eduardo Aunós, near Montjuich mountain. In spite of this, its residents remained on the margins. 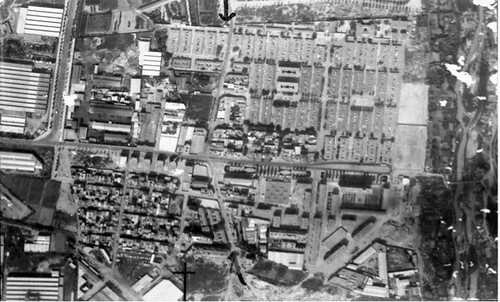 In the sixties and seventies the city expanded: many new workers came from the south, and new shanty towns were built and demolished one after the other. Many of these new immigrants ended up in the casas baratas, where they generally mixed with the resident population. Many of them were gypsies, so Bon Pastor and the other neighborhoods of casas baratas began to be considered barrios de gitanos (neighborhoods of gypsies), though non-gypsies were the majority. The families of the casas baratas were poor but lived in partnership with one another. They often ate together in the streets or plazas, helped the ones who needed help, celebrated big parties with huge fires for San Joan on June 23rd, took care collectively of the children, and in general enjoyed a decent quality of life, though the houses were small and the salaries low. So when the Francoist major put forth the proposal to demolish the casas baratas, the residents protested. Trees had grown, and what in the thirties looked like a concentration camp, in the seventies looked like an island of peace and communitarian life in the middle of the city. A neighborhood association was founded in Bon Pastor – the Asociación de Vecinos – who published pamphlets and bulletins critical of the regime. When Franco died, the plan for demolition was retired; the City Council began to organize projects to rehabilitate the houses, and to give credits to families who wanted to invest in improving their dwellings. 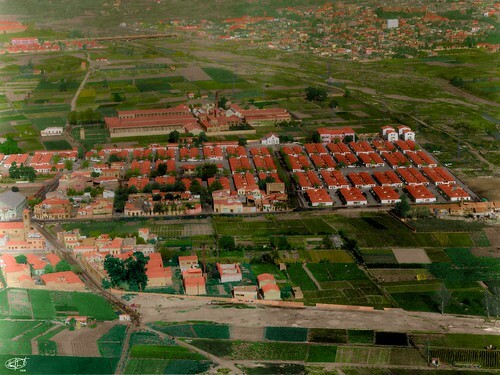 Bon Pastor in the eighties, an island of one-storey houses inside the vertical city. Many families invested good portions of their income in their houses: in Bon Pastor many families enlarged their living rooms, or even built a second floor, thus converting their small old dwellings into little jewels of popular architecture for which they kept paying very low rent. But the 1980s was also the decade of heroin spreading throughout the streets of Europe. The casas baratas, especially the group Eduardo Aunós and Baró de Viver, became places of drug selling for all of Barcelona. This enforced the image of the ‘cheap houses’ as dangerous and infamous places in need of a radical solutions. So rumors began to spread that the City Council was thinking back to the Francoist plans for a complete demolition of the four neighborhoods. In fact, in 1987, the first barrio de Casas Baratas was demolished – Barón de Viver, just a couple of kilometers far from Bon Pastor. His residents were moved to new high buildings, and Bon Pastor’s inhabitants felt the end of their houses and neighborhood was near.